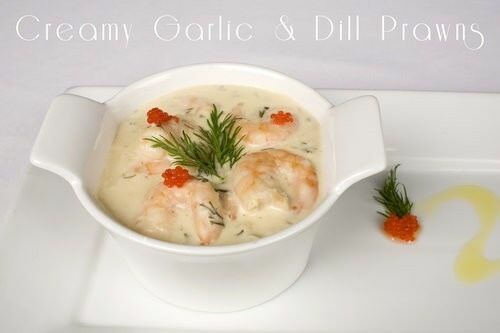 This is a dish I make all the quite a lot, it is my “low fat” version of the classic Creamy Garlic Dill Prawns as it doesn’t have any cream. I make it all the time because it is quick and easy. If you substitute the prawns for smoked salmon and capers it makes a great pasta sauce too. This tasty dish uses Low Fat cream cheese to replace heavy cream in the recipe. Cream cheese makes a wonderful thick sauce without adding any extra fat, or thickeners. 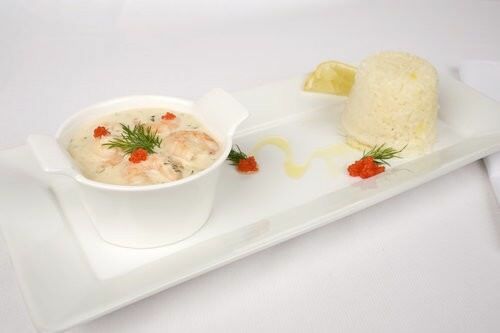 Green Garlic Prawns are raw prawns that have been marinated in garlic. They are available at many supermarkets, but if you can’t find them, you can replace them with regular raw prawns. You will still get plenty of garlic flavour in the dish. This recipe makes 2 serves if served without a side dish. Or 4 serves with a side of rice or pasta. Put the cream cheese and stock in a saucepan over medium heat. Using a stick blender, combine the two ingredients while heating until the liquid is smooth and creamy. Continue to simmer uncovered on the stove while you chop the garlic, chili and shallots finely. Add these ingredients to the simmering pot stirring occasionally. When stirring scrape the creamy buildup from the sides and stir back through the sauce. Chop half the dill and add to the cream sauce. Continue to simmer until the sauce starts to thicken, usually 15 – 25 mins. Once the sauce is to your desired consistency stir through the green prawns, Heat prawns through in the sauce for 1 minute and then turn it off. Add the Dill, lemon juice and pepper to taste. Serve with rice or pasta.